This trigonometrical table is an example of mathematical marasmus. I am touched by exact values of a sine and cosine. No comments. 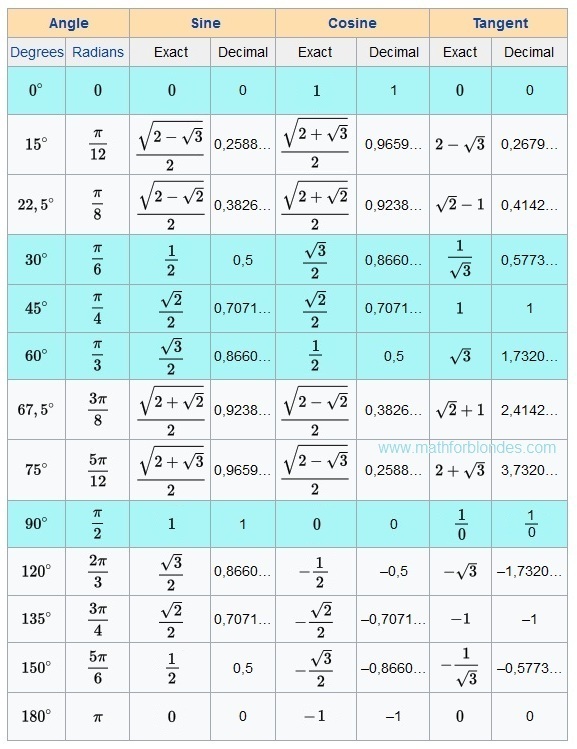 If mathematicians do not know what is trigonometric functions, let read here. If mathematicians are not able to divide into zero, let study. I like the idea of this table. I do not like its contents. 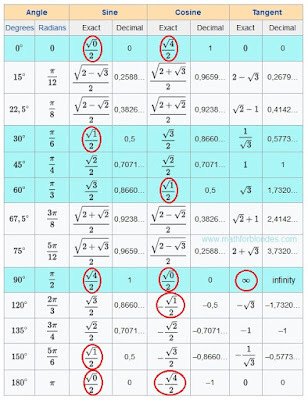 I corrected this trigonometrical table. The most popular angles are highlighted with blue color. 0, 30, 45, 60, 90 degrees most often occur in textbooks.Common fractions will be useful to pupils to fight against teachers. Decimal fractions will be useful physics and to engineers to calculations. 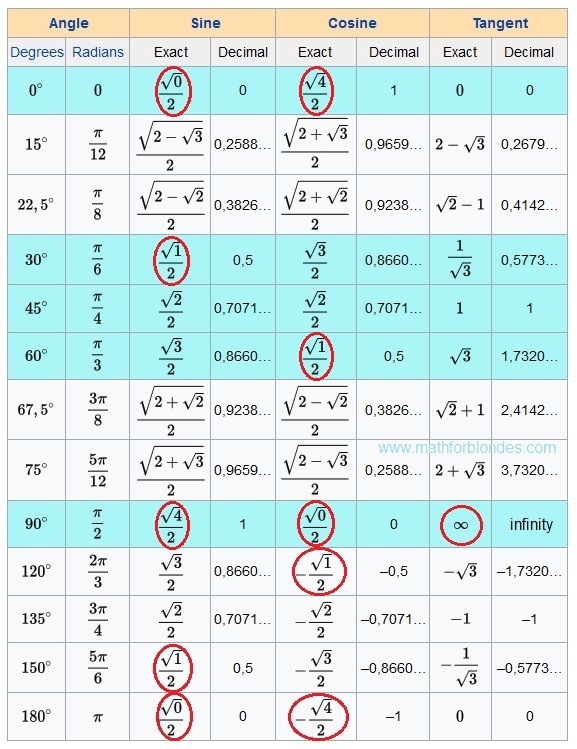 In this trigonometrical table there are no cotangents (cot, cotan, cotg, ctg, ctn). Anything terrible. 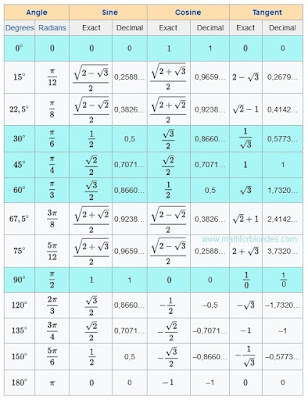 There are useful formulas which will help you. Sin 0, 15, 22.5, 30, 45, 60, 67.5, 75, 90, 120, 135, 150, 180 degrees in this table. Cos 0, Pi/12, pi/8, pi/6, pi/4, pi/3, 3/8 pi, 5/12 pi, pi/2, 2/3 pi, 3/4 pi, 5/6 pi, 1 pi radians. 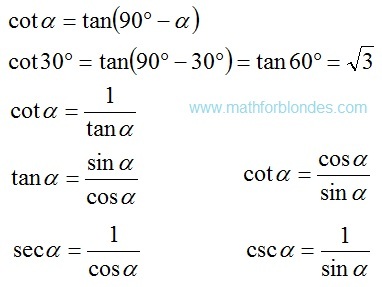 Tan pi/2 radians or 90 degrees it makes sense.